In order to setup an account & recieve standard billing terms you will need to fill out and return a credit application. 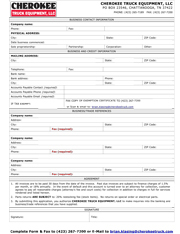 Please download, print & fill in the following form. You can then scan & send the completed copy thru our submittal form below or fax it to (423) 267-7200. We will get in touch with you shortly. Thank You.